Different Indian languages have literary works of great cultural and artistic value but regionalism often comes in the way of connecting people with great literary works. What is the way to bridge this gap in your opinion? In a multilingual society and the states on linguistic basis, regionalism of course takes its own toll on many aspects and one important impact is on the literary works of great cultural and artistic value. Due to political and other reasons there is a vast gap in connecting the people. Rightly you have diagnosed the cause for the gap and that is narrow regionalism leading to parochialism. It should therefore, be the foremost duty of the broad and nationalistic minded patriots to create opportunities for the people of religions and regions, languages and cultures to move freely and absorb the greatness from others. Thinking on this line, this INTERNATIONAL TRANSLATION DAY is quite heart warming. On this happy occasion of International Translation Day, I pleasantly look back on my passion for translation and what little that I could achieve, gives me an enormous sense of satisfaction. Yes, I started my translation journey with the English to Tamil through MTS Academy- a wing of Mylai Thiruvalluvar Tamil Sangam- founded by Dr. Cheyon, former Director of All India Radio, Chennai. 2. “Voice of Valluvar” ELIXIR OF LIFE” 10 Research Articles on Thiruvalluvar thoughts –Translated work from Tamil to English- l.
3. “CRR at the Peak – Translated work from Tamil to English – a biographical work on the former Chairman of L & T Sri C R Ramakrishnan..
4.”ThirukkuraL” translated from Tamil to English in Haiku format. 2. “Cukkos Song” – Bharathiyar’s epic poem“KUYIL PATTU” in Tamil translated to English. Quite a good number of immortal poetry of Bharathiyar has been translated into Tamil and they were published for more than a year in the Indian Periodical- an accredited online magazine. 3. Translated the English poems under the caption “COSMIC ACCIDENT” of Dr. A Padmanabhan, former Governor of Mizoram and Chief Secretary of Tamil Nadu into Tamil “விண்வெளி விபத்து”. 4. Translated the poems of Japanese poet Daisaku Ikeda from English to Tamil “தண்ணீர் ஓசை” and published in 2013. 5. “REIKI in Human Welfare”- A book on REIKI translated from Tamil to English. 7. “Chithra Guptha” – History of Lord Chithra Guptha in Tamil by Sri A K Selvadurai–Translated from Tamil to English in 2015. Thiruvaiyaru Thyagaraja’s PANCHARATNA KEERTHANAS were translated from Telugu to Tamil and the same was rendered by a music troupe from Madurai and was brought out s a CD with a printed Booklet. Yes,when I started my translation journey from the MTS Academy, I never imagined that I will go this far! Translation of a prose to prose my not be that difficult;but translation of a verse in any form to a verse of the same form indeed poses a formidable challenge to the translator. All my translations are Verse in English to Tamil and vice versa! I was pleasantly surprised that a literary Organization called “SOUTH INDIA SOCIAL AND CULTURAL ACADEMY” based at Chennai honored me with their ADMIRABLE ACHIEVER AWARD for my trans-creational (TRANSLATION) work in 2015! My fancy for Translation Literature attracted a literary organization- “The South Indian Social and Cultural Academy”, Chennai and they in an impressive function held here in Chennai Hotel Palmgrove on 26/12/2015, honored me with the title “மொழியாக்கச் செம்மல்” (An accomplished Translator). Retd. Madras High Court Judge Hon’ble Pon. Bhaskaran handed over the trophy. Again taking into account all my literary pursuits including TRANSLATION, United Writers Association of India from Chennai and Simhapuri Fine Arts Academy of Nellore honored me with their respective ADMIRABLE ACHIEVERS AWARD 2018! NTR MEMORIAL ALL INDIA AWARD 2018! The former was handed over by the Hon. Union Minister Ganesh Prabhu and the later by two of the Hon. AP Ministers. I vividly recall my presentation of a paper on TRANSLATION LITERATURE in the 10th International Writers Festival and Indian Ruminations Literary Festival held in Thiruvananthapuram in December 2014. I know the futility of bringing out a great topic such as “TRANSLATION LITERATURE” within a frame of 3500 to 4000 words. Yet I have made an honest attempt to present a paper based purely on my personal experience as a translator to this august audience drawn from different parts of the globe. I hope you will find something worthwhile out of this. I thank you all for your patience and the organizers for having given such a wonderful opportunity to present this to you. Wishing you and your family members a very happy and healthy, peaceful and prosperous New Year 2015! Those who are interested for more details, may please read the Blog post titled IN THE WONDERLAND OF TRANSLATION LITERATURE from the archives -posted on 3rd January 2016. With this we end this Sunday story rededicating on this auspicious dy of INTERNATIONAL TRANSLATION DAY to pursue my passion of TRANSLATION! 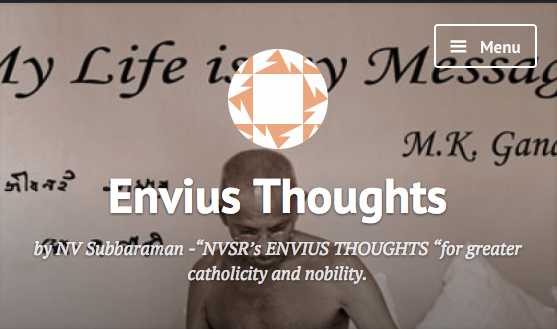 ENVIUS THOUGHTS crosses 1,74,000 views. I am glad to share with you that with the 69th view at 10.30hrs today viz Sunday the Thirtieth (30th) September 2018 , total views of the BLOG crossed ONE LAKH AND SEVENTY FOUR THOUSAND (1,74,000) from more than 210 countries around the world on the 1249th day and 1361st post, thanks to your support and encouragement. Kindly continue. Music is Divine; enthralling, ennobling and entertaining! All over the world music has its own ehalted position offered by the music lovers. Music world around has hundreds of shapes and sounds, varieties varying from ethnicity to languages, country to country. Let us have look at some of the classifications just as an example. In certain countries in fact Music is worshipped- as for example in India what is called “NAATHOPAASANAA”. That is worshipping NAADHAA –Sound- as God and worship regularly and religiously by rendering or listening.. In that way, great Karnatic music composers and musicians- a great galaxy of them practiced the worship which culture and tradition continue till this day despite this age is fast food age where man has no time to stand/sit and listen to music. 27 M K Thiagaraja Bagavathar. The list indeed is endless! There are several music academies regularly conducting music programs all over the country and in particular my home state of Tamilnadu which has as summer, winter like nature’s seasons, has an additional SEASON called MUSIC SEASON which normally sets in November-December and lasts till January!. Like migratory birdsd flocing Pulicat and Mudumalai sanctuaries , Musicians and Music Lovers from all over the countries and many countries abroad flock to Chennai for the season and enjoy music, dance, discourses etc all through the Season! Thirteenth year this year, programs started on 18th December and concluded on 25th December after the continuous music feast-festival- for eight days right from Morning 7.00 to Night 10.00! Totally there were SIXTY programs! Year 2017 is the 66th ART FESTIVAL commencing on 11th December to last upto17th January 2018- for 38 days and 158 programs!! I also attended two programs one in each. I was happy to note that audience were delighted with all programs and enjoyed. Auditoria were decently full. Ever year Thiyagaraja Swamigal’s aradhana is conducted in Thiruvaiyary, in Thanjavur District of Tamilnadu for four days in January on the occasion of the poet-composer’s Samadhi. Practice here is on all the four days from morn till night musicians young and old from all parts of the world assemble and they have to render only the compositions of Thiyagabrammam. Most of his thousand and odd keerthnas are in Telugu and on Lord Rama and some are in Sanskrit. One John Higgins from England came to attend the aaraadhanaa and so immersed in Thyagaraja Krithis, learnt and performed. He was named as John Higgins Bhagavathar! The first session will be devoted to group singing by all the singers from different parts of the Globe assembled-the Pancha Rathna Keerthanas of the Saint Composer. It meens FIVE GEMS OF Lyrics. In the world of Karnatic music -the term MUSICAL TRINITY- refers to the greatest three composers Thyaga Brahmam, Muthuswami Deekshithar and Shyama Sastrigal. Thyagayya of Thiruvaiyaru-Tamilnadu has written hundreds of Keerthanas in praise of Lord Rama in Telugu and of them five pearls like compositions are called PANCHA RATHNA KEERTHANAS which are rendered by all Carnatic musicians wherever they are. In the year 1963 Pandit Jawaharlal Nehru, the then Prime Minister of India, while inaugurating the “Thyagabramma Aradhana” in Thiruvaiyaru expressed his desire that the Telugu keerthanas should be translated into other languages for greater and deeper appreciation of the songs all over India. It would appear that no efforts were made in this area. Yes; it was a great day in the life of these music couple of Madurai and their colleague musician! A historical day, an exhilarating day, an inspiring day to remain evergreen in their minds throughout their life time! It was Friday the 13th February 2015- the day on which former President of India His Excellency Dr. Abdul Kalam visited a humble musician couple living in Madurai to personally hear the great Pancharathna Keerthanas of Thiruvaiyru Thiyagaraja swamigal – Thyagabrammam-in Telugu translated into Tamil from the lips of the karnatic musician accompanied by her husband in violin and a co-musician in Mridhangam. Dr. Kalam has already heard the renderings in Tamil through the CD which he came across through a common friend. He said that he was so impressed by the translation and the rendition that he used to hear one gem each day. Now utilizing his visit to Madurai he wanted to hear right from the troupe directly! Of course the musicians who with great efforts brought out the CD were making efforts to render the Keerthanas in the presence of the former President who loves Karnatic music, our culture, our traditions, our literature et all with all his heart. After fulfilling a few engagements in the city of Madurai, he planned to visit the musicians in the night and accordingly he arrived at their humble residence at 9.30 in the night and spent an hour. The musicians were in an ecstatic mood and delighted to have a great and noble personality in their humble residence. As the public saw the former President’s convoy entered the street, there was a big surge to have a glance of Dr. kalam who indeed is “காட்சிக்கு எளியவன், கடுஞ்சொல்லன் அல்லன்” எனவே சிறந்த ஆட்சியாளனாக விளங்கியவர், உலகமே வியந்து பாராட்டப்பட்டவர். Dr. Abdul Kalam being recieved at the residence of Smt. Ranganayaki, vocalist who rendered Tamil Pancharathna Kirthanas along with her husband Shri Sachidanandam, Violinist and Dr. Thiyagarajan, Mridhangist. As Dr. kalam arrived he was received with a shawl and the team that rendered the “five gems” of the Saint composer was duly introduced. As he was eager to hear the melodious rendering of “ENTHARO MAHANUBAVULU”- “எத்தனையோ மகான்கள் அத்தனை பேருக்கும் வந்தனம்” it was rendered by the team-vocal accompanied by violin and mridhangam. The prestigious guest heard the rendering with great attention and his body language expressed it all- he was so enthralled with the translation and the rendering. Then he openly appreciated the artists profusely and said the translation was ideal. For decades he has been hearing this ‘keerthana’ without understanding the full meaning and import of the song. He enquired about the person who translated the ‘keerthanas’ and he was shown the profile of the translator and Dr. kalam read it with great joy. He requested the artists to convey his appreciation and compliments to the translator. After a few snaps with the artists and others former President – dignitary Guest- left the house by 10.30 in the night. Naturally the hosts could not sleep ruminating over the dream like visit of the former President His Excellency DR. Abdul Kalam to their abode in Madurai. Yes: who are the dramatic personae- in this lovely event on that happy night of 13th February 2015? That is the team of three musicians who with great efforts brought out the CD of Tamil Pancharathna Keerthanas at the instance of Dr. Meenakshi Pattabiraman, former English Professor, a poet, writer and scholar of Madurai. Mrs RANGANAYAKI SACHIDANANTHAM B.Com, M A, M Phil (Music)- Vocal: B High grade AIR artist, TV artist, teaching music to a large number of children, has participated in the NADHA NEERAJANAM” program of TTD Devasthanam; Thirumala, Widely travelled in Singapore and Malaysia for spreading the great carnatic music. Mr. D Sachidanandam Violinist: AIR ‘A’ Grade artist; Kanchi Mutt Asthana Vidwan. TV artist. Has widely travelled in America, Singapore and Malaysia and rendered Solo violin and accompanied famous vocalists. Has trained a large number of students. Dr. K Thiyagarajan, B. Com; M A (Music) Ph.D- Mridhangist: Serving as Assistant Professor Mridhangam in the Sri Sadguru Sangeetha Vidhyalaya Music college, Madurai.Awarded the titles “Miruudhanga Vadhyamani”, “Kalaivalarmani” etc. Kanchi aasthana vidhvan. AIR, TV artist. Visited Singapore and Malaysia. A large number of students have been trained by him. All the three have founded an organization called “THISRADWANI” in Madurai to promote Karnatic music in the Society. It is rendering very effective, efficient and excellent service in the cause of Karnatic music in its third year now. N V Subbaraman –Translator of the Telugu Pancharathna Keerthanas intoTamil – a desire that was expressed by the then Prime Minister of India Pundit Jawaharlal Nehru in the year 1963 while inaugurating the annual Thiyagabramma Aradhana Festival in Thiruvaiyaru. Saint Composer’s period is 1767- 1847. 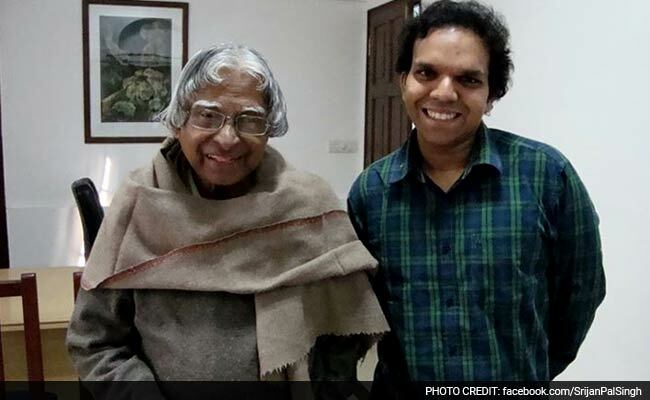 Narayanamurthy – Common friend of former President Dr. Abdul Kalam who gave the copy of the CD to him. Mr. Murthy served with Dr.Kalam as a Director in ISRO. He is the brother of the violinist D.Sachidanandam, husband of the vocalist Smt. Ranganayaki. The innovative translation of the keerthanas from Telugu to Tamil attracted the attention of the media – most powerful instruments-.and the leading Tamil monthly magazine named KALAIMAGAL made a review of the CD in one of its issues-February 2013. On 22nd of this month THE HINDU-India’s National Newspaper since 1878 made out a news about this CD with tremendous response from the readers of Hindu interested in Karnatic Music and in particular Thyagayya’s keerthanas. In one of the ongoing music festivals organized by the first referred CHENNAIYIL THIRUVAIYARU I was honored on 25th December with a shawl and sandal garland for my translating the Keerthanas to Tamil. In the second one a reference was made to the translation work. A neighborhood news paper ANNA NAGAR TIMES in a story on ENVIUS in detail referred to this translated keerthanas which evoked the curiosity of the readers. In this way MUSIC AROUND THE WORLD is exhilarating, ennobling and entertaining. This much is for this Sunday story today and we shall meet tomorrow. Thanks. Stock taking of the year-positives only! 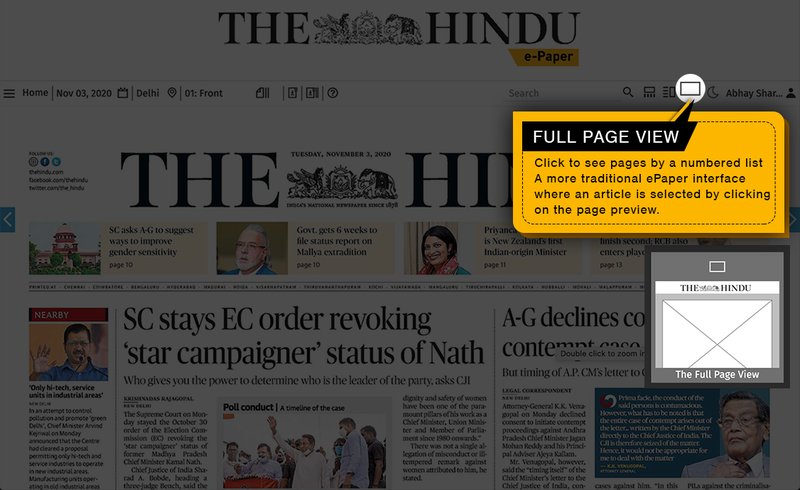 The HINDU and ANNA NAGAR Times carried news and story in their respective news papers. It is not decent to trumpet what I GAVE TO THE SOCIETY in the year and hence I don’t but only gratefully recollect what THE SOCIETY HAS GIVEN ME with all HIS GRACE AND ELDERS BLESSINGS! GOOD BYE to TWO THOUSAND AND SEVENTEEN! Let me welcome the TWO THOUSAND EIGHTEEN tomorrow! Dr. Abdul kalam with his aide Srijan Pal Sing on the last day of his life-27/7/2015. Two of the tallest leaders served the holy land! Ten at Madurai at the artists’ humble homes- a delight! We pay our respects to him in all humility. 2. A great Day with Dr. Abdul Kalam on 27/7/2015. 3. A strange paradox on 2/8/2015. 4. Thyagaraja Aradhana Is Today. on 17/1/2017. all available in the archives of this blog. I am glad to share with you that with the 124th view at 19.15 hours yesterday viz Wednesday the 26th July 2017, total views of ENVIUS THOUGHTS crossed NINETY NINE THOUSAND (99000) on the 859th day and 924th post from more than 210 countries around the world, thanks to your support and encouragement. Kindly continue. Thanks aplenty. Carnatic Music Legend Smt. 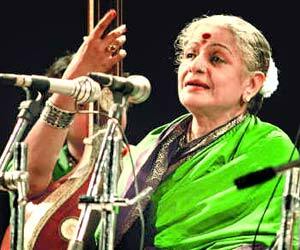 M S Subbulakshmi enthralled UN by her divine performance. All respond to this Divine art- Goddess Saraswathi grants! May all in the world observe with full verve and appetite! Make the people take to the art and science of Music great! Yes, I am sure my esteemed viewers of ENVIUS THOUGHTS in https://nvsr.wordpress.com may readily recollect that these figures indicate the posts on which the TALE OF A BLOGGER appeared. It was so designed that there will be one TALE for every 50th post and thus so far there have been SIXTEEN TALES OF A BLOGGER from Number 1 @50th and Number 16 @800th! And today it is 850th post and naturally TALE OF A BLOGGER Part 17 is on your computer screen! With the grace of the Goddess of Learning Shri Saraswathi sitting on the white petals of the Lotus with her Veena on HER hands, the grace of Saint Thiruvalluvar, Bharathiyar and Mahatma Gandhi and the support of more than 89000 viewers from more than 200 countries, the Tale of A Blogger continues and today it is Part 17 heralding the EIGHT HUNDRED AND FIFTIETH (850th) post in 787 days. Esteemed viewers may kindly recollect Part 16 on the 800th post was published on 23rd March 2017. 23rd March overall view score 83493- 796th post in 734 days. 84000 crossed on 26/3/2017-800th post in 737 days. 86000 10/4/2017-815th post in 752 days. 87000 19/4/2017-824th post in 761 days. 88000 26/4/2017-831st post in 768 days. 89000 04/5/2017-839th post in 776 days. This is in ANNA NAGAR TIMES dated 3rd April 2017. THIS IS MOGAPPAIR MAIL dated 23/4/2017. Between Part 16 and Part 17, the average views per day is consistently above 100 and the maximum was 222 on 27th March. 23rd April 2017 765th day and 828th post 177 views. 3rd April .2017 745th day and 808th post 160 views. 21st April 2017 763rd day and 826th post 155 views. 9th April 2017 751st day and 814th post 152 views. This Blogging has become a passion for me and as such I spend quite some time on this every day. I have already mentioned that looking at the statistics and recording the same in my diary has become a routine. Many a time, I ruminate about the purpose and the effect of my postings, how best to improve upon the theme, content and expression that can have a better impact over my esteemed viewers from more than 200 countries. I used to analyze my earlier and past postings. “Consolidated comments of several viewers” (other than those referred to above) in two parts. 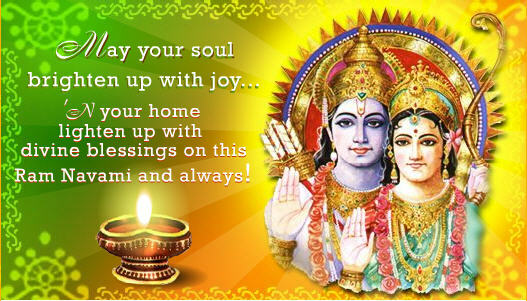 One Mrs. Elezabeth K Mona from Hyderabad appreciates every post and in particular posts on Special Days. She says “We gain a lot of knowledge in an interesting way by reading your posts. Thanks for sharing”. While the responses are very positive and encouraging, inspiring and motivating, I have a feeling that further improvement is very much called for lest interest may gradually wane and fall into oblivion! Some of my posts do give me a sense of satisfaction as those particular posts appear to give a specific category of viewers some solace and a greater sense of anticipation of something good. Some time ago, I wrote a PRAYER series out of which “A CANCER PATIENT’S PRAYER” is a regular lead by many and it occupies the TOP position of VIEWS TOPICWISE. Yes total number of Views as of now is 16731 out 0r 89000. Almost 20%. Second highest is again related to my post on CANCER- NATIONAL CANCER SURVIVORS’ DAY (USA) which has a view score of 8812 as of now- more than 10% of the total view. There are Cancer Patients/Cancer survivors who find reading this post giving solace and comfort. I also pray for their wellbeing. With a heavy-very heavy-heart, I recollect my beloved wife suffering with cancer for a few moths and succumbing to the deadly decease on that fateful day 20th August 2014. It is immensely pleasing that I have regular 118 followers from all over the world. What else can one aspire for in keeping a BLOG just for literary purpose only! Great fund of statistics provided by WORDPRESS is indeed remarkable. Summer in Chennai is awful-not less than 40 degrees in the last quite a few days. Practically confined to home- what else to expect from a person in his 76+ !!!!!!! Early morning walk, morning temple visit, post sunset a twenty minute outing to enjoy fresh air- away from the electric fan and the AC! One of the greatest Saint Poets Tamilnadu has seen is Thyagabrahmam- a great devotee of Lord Rama on whom the poet has written and sung hundreds and hundreds of keerthanas in Telugu is 250 years now. He was serving Rama and spent all his time in Ramasmarana having been born in 1767. He was born in Tiruvarur and spent his time on the banks of THIRUVAIYARU- in Thanjavur district. I happily recollect the appreciation my Tamil translation of Thyagayya’s Telugu PANCHA RATHNA KEERTHANAS- FIVE PEARLS OF HIS OFFERINGS- first of its kind in Tamil- from our former President Dr. Abdul Kalam who visited the house of the musicians who brought out the CD of Tamil keerthanas, asked them to sing, had dinner with them in Madurai. Dr. Abdul Kalam with the musicians in their Madurai residence. A detailed story you can read from the archives of ENVIUS THOUGHTS here in https://nvsr.wordpress.com under the caption “A GREAT DAY WITH DR. ABDUL KALAM”. I am glad that the Tamil version is being rendered in many places including US. It is all the will and gift of Goddess of LEARNING SARASWATHI. Thanks my dear viewers, I stop for the part 17 of the TALE. Blogger in his working table in his casual attire! THE E magazine INDIAN PERIODICAL regularly publishes my articles in their weekly updates. For this Sunday’s kindly click the second link, select my ARTICLE on BHARATHIYAR’s – OBEISANCE TO THE NATION read and make your kind comment on the space provided beneath the article which will benefit other readers also.